'The School picnic took place on Wednesday, July 14th, on the one fine day of the summer. From forty to fifty of us filled three brakes (horse drawn), and set off at half-past ten for Ulverscroft Priory. The country beyond Woodhouse Eaves was at its best, and all enjoyed the drive and walks along the lanes. Having inspected the ruins, and eaten luncheon on the grass, we made a start for Newtown Linford; the distribution of some packages of sweets engaged attention on the way, and gave rise to sundry witticisms which were keenly appreciated. After a walk through Bradgate Park a rest was called at Old John, where a friendly echo was greeted with discordant jeers and salutations, a representative of Woodhouse using most discourteous language; our galaxy of youth and beauty then prepared to face the camera. The tea at Hall Gates came at an opportune time after the heat of the afternoon; it would be difficult to imagine a more bounteous spread than that provided for us by Mrs Shedden in a fine old barn, cool and well ventilated. After half-an-hour's quick cricket, a start was made for home through Cropston and Rothley, the day's pleasures having given universal satisfaction. Old John can be seen in the background. 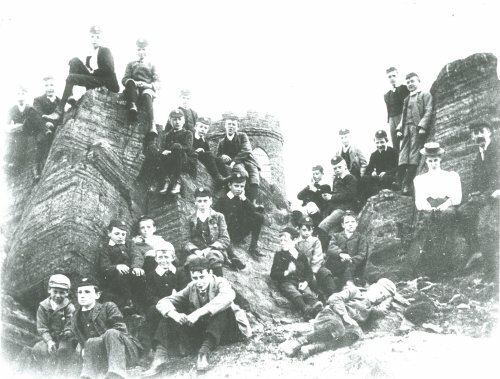 It is a stone folly in Bradgate Park which still stands today.